The year-end holidays have inspired in me nothing if not an appreciation of the finer, simpler things in life… Picture books lovingly crafted being among the finest of them all! A touching tale paired with a frankly gob-smacking attention to detail in Browne’s artwork, this picture book is a treasure and must-have for any family bookshelf. Remembering the days when my mother raged at the swaps of my own youth (a family-heirloom broach for an ice-cream container of silkworms, for instance), Gaiman’s understanding of the world of children is spot-on, while McKean’s signature use of photo images, ink and scraps compliments this in the perfect match. The whimsical style of Ian Falconer, artfully rendered in black, white and red, has the timeless appeal of Babar and Pooh and a bear delivered to Paddington Station, and Olivia’s tall tales will worm their way into yours and your children’s hearts with the ease of a circus-performer, of this much I’m sure. 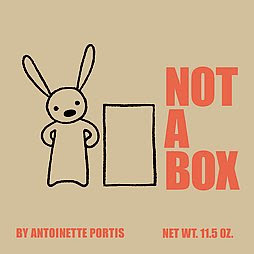 In the same vein as Olivia and her marvellously tall tales, Portis’ Not a Box likewise captures the proclivity of the child’s mind for imaginative stretches. When the story’s bunny is asked, “Why are you sitting a box?” the response is naturally, “It’s not a box” (while the picture of a rabbit in a box drawn plainly in black pen is embellished by a race-car in red). When asked, “What are you doing on top of that box?” the red pen boasts a mountain top while the flag waves triumphantly, “Rabbit Peak.” And so the questions ensue, with the bunny’s increasing frustration in having to reiterate that it is not a box! The final question posed is, “Well, what is it then?” Thinking long and hard, the bunny eventually declares, “It’s my Not-a-Box!” and launches off in a space rocket (not a box!). Reminiscent, both visually and in theme, to Antoine de Saint Exupery’s The Little Prince, this is a picture book that will open doors for grown-ups and free boxes from a boring fate the world over.